Financial Support To Qualified Registered Medical Practitioners, Doctors, Hospitals, Clinic, Nursing Homes, Pathological Labs, Testing Labs, etc. Term Loan for Property, Project Finance, Furniture & Fixtures, Medical Office Equipments, Vehicle, Ambulance. 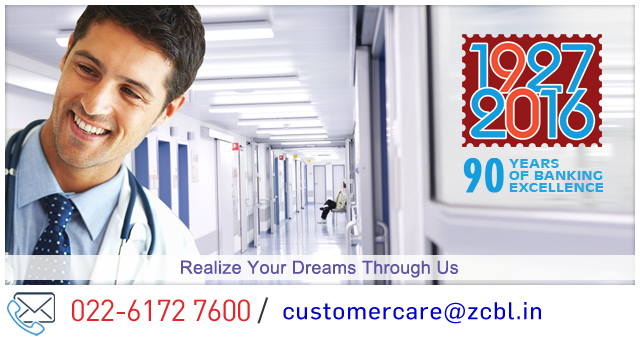 Secured Overdraft Against Property for Expansion of Hospital Repairs / Renovation / Improvement / Extension of Clinic Hospital / Working Capital and for any other activities related to the Medical Profession. Attractive Rate of Interest (ROI) @ 11.00 % p.a. Low Margin @ 25 %. Maximum Amount : Rs. 1500.00 lacs. Term Loan : Repayable in 84 EMIs i.e. Maximum 7 years.